By Shamika Dwarika, Elsabe Steenhuisen and Tshenolo Masha. Help desks have proven to be a good service point for pro bono access. They are well situated and within easy reach for clients who frequent the courts or government departments requiring legal advice. They are also a convenient and efficient system for attorneys to provide their pro bono hours in a space where they frequently operate and work. Despite its limited staff, the Durban office runs 11 help desks, which enable us to extend our services to the wider community. In addition to specialised Consumer/Small claims, Refugee, Housing, Labour, Family and Deceased Estates help desks that are based at the Durban office in the CBD, there are several general advice help desks. These are based at the Chatsworth, Ntuzuma and Umlazi magistrates’ courts. A number of new projects have recently been added. 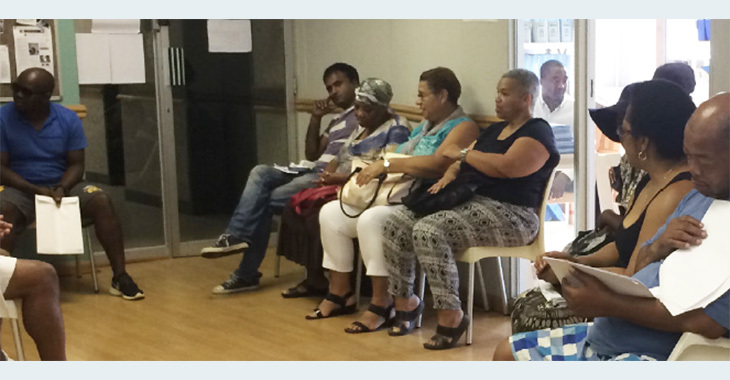 In December 2016, a general advice help desk was launched at the Verulam Family Court which is held on the first Tuesday of every month and is accessible to residents of the Verulam, Ottowa and Phoenix communities. The project was launched with the co-operation of the Department of Justice and there has been no shortage of attorneys willing to staff this help desk. The office recently partnered with the KZN Blind & Deaf Association to conduct monthly workshops for their beneficiaries, and held a once-off help desk in December 2016 with six attorneys in attendance. There are plans to run a similar help desk for the Pietermaritzburg branch in due course. In a new development, a general advice help desk will be held in the Durban High Court in partnership with the KZN Law Society. The help desk will be the first of its kind for the Durban office and will run daily from 09:00 – 12:00. ProBono.Org had a test run on 14 March and the help desk will officially launch on 10 April. This help desk will be staffed by attorneys with a minimum of 5 years experience. If any attorneys are interested in participating in this new venture, please contact ProBono. Org’s Durban office on 031 301 6178. A divorce legal clinic started on 7 February 2017 at the Johannesburg Regional Divorce Court with one attorney and one advocate attending on Tuesday mornings. Ten candidate attorneys joined the programme on Monday mornings under the supervision of Adv. Elsabe Steenhuisen. After training at the court on 13 and 20 March 2017, they started to assist the public from 27 March. On average, they assist 10 members of the public per session. As a pilot project and in support of the SA Law Reform Commission’s paper, Project 31: Family Dispute resolution, the clinic has involved the pro bono services of mediators and counsel. The aim is to offer a complete service to the indigent, and if the divorce disputes cannot be settled by mediation and settlement agreements, counsel will continue with pre-trials and trials. The focus is on dispute resolution regarding assets, and allowing children to voice their opinion in an attempt to curtail conflict. The involvement with the clinic has led to training for counsel (two sessions) and candidate attorneys (four sessions). More training is planned on different types of curatorship in family disputes (May 2017), and the functioning of children’s courts (June/July 2017) which will be open to all legal practitioners. Following a call by conveyancers at a pro bono briefing session held at the Johannesburg Deeds Office, we are setting up a help desk at the Deeds Office. This help desk will form the basis for a similar help desk at the Pretoria Deeds Office. We are aiming for the help desk to be operational by May.